Western blot analysis of extracts from various human cells using Nectin-2/CD112 (D8D3F) XP® Rabbit mAb (upper) and β-Actin (D6A8) Rabbit mAb #8457 (lower). 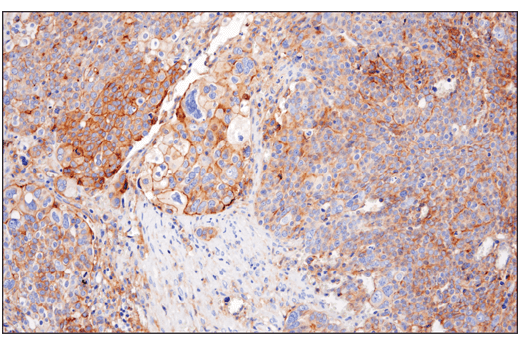 Immunohistochemical analysis of paraffin-embedded human ductal breast carcinoma using Nectin-2/CD112 (D8D3F) XP® Rabbit mAb. 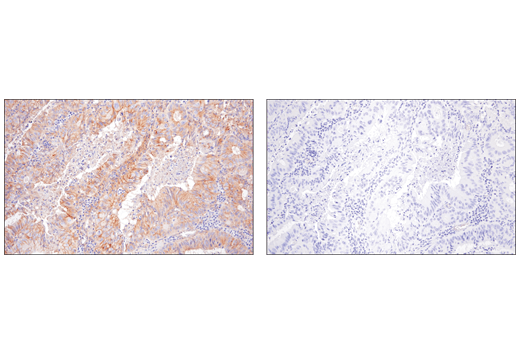 Immunohistochemical analysis of paraffin-embedded human colon carcinoma using Nectin-2/CD112 (D8D3F) XP® Rabbit mAb (left) compared to concentration matched Rabbit (DA1E) mAb IgG XP® Isotype Control #3900 (right). 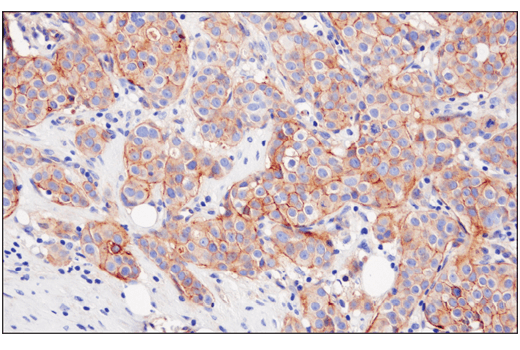 Immunohistochemical analysis of paraffin-embedded human ovarian serous carcinoma using Nectin-2/CD112 (D8D3F) XP® Rabbit mAb. 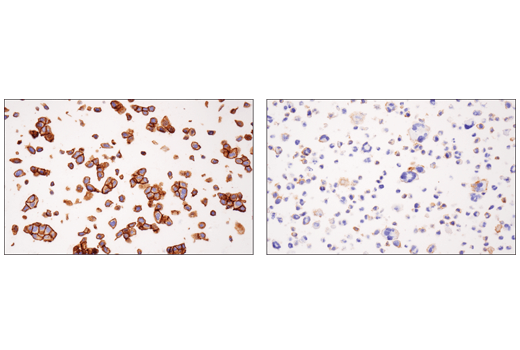 Immunohistochemical analysis of paraffin-embedded RT4 cell pellet (left, high-expressing) or HDLM-2 cell pellet (right, low-expressing) using Nectin-2/CD112 (D8D3F) XP® Rabbit mAb. 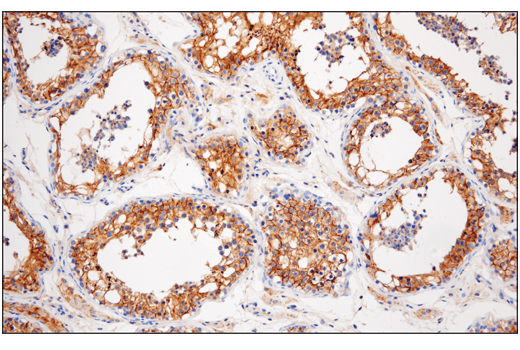 Immunohistochemical analysis of paraffin-embedded human testis using Nectin-2/CD112 (D8D3F) XP® Rabbit mAb. 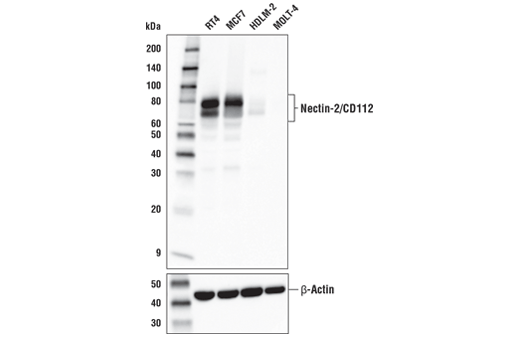 Nectin-2/CD112 (D8D3F) XP® Rabbit mAb recognizes endogenous levels of total Nectin-2/CD112 protein. Monoclonal antibody is produced by immunizing animals with recombinant protein specific to the amino terminus of human Nectin-2/CD112 protein. Nectin-2, also known as CD112 and poliovirus receptor-related 2 (PVRL2), is a single-pass type I membrane glycoprotein ubiquitously expressed on various human tissues (1). It is a calcium independent cell adhesion molecule known to interact with several cell surface receptors, including DNAM-1 (CD226), LFA-1 (CD11a), Nectin-3 (CD113), TIGIT (VSTM3), and PVRIG (CD112R) (2-7). It is one of the major constituents of adherins junctions, and therefore plays a central role in a number of cellular processes, including adhesion, migration, and proliferation (2-8). Within the immune system, Nectin-2 modulates immune cell signaling. Upon interaction with DNAM-1 expressed on T and NK cells, Nectin-2 stimulates proliferation and cytokine production (4). Upon interaction with PVRIG, Nectin-2 inhibits proliferation (7). Thus, Nectin-2 can be either a co-stimulator or a co-inhibitor of immune cell function depending on competitive receptor interactions. Nectin-2 also serves as an entry for certain mutant strains of herpes simplex virus and pseudorabies virus, and it is involved in cell to cell spreading of these viruses (8,9). Alternate transcriptional splice variants, encoding different isoforms, have been characterized (10,11). Eberlé, F. et al. (1995) Gene 159, 267-72. Lopez, M. et al. (1998) Blood 92, 4602-11. Satoh-Horikawa, K. et al. (2000) J Biol Chem 275, 10291-9. Bottino, C. et al. (2003) J Exp Med 198, 557-67. Reymond, N. et al. (2004) J Exp Med 199, 1331-41. Deuss, F.A. et al. (2017) J Biol Chem 292, 11413-11422. Zhu, Y. et al. (2016) J Exp Med 213, 167-76. Devilard, E. et al. (2013) PLoS One 8, e77424. Martinez, W.M. and Spear, P.G. (2001) J Virol 75, 11185-95. Warner, M.S. et al. (1998) Virology 246, 179-89. Ota, T. et al. (2004) Nat Genet 36, 40-5. Gerhard, D.S. et al. (2004) Genome Res 14, 2121-7.